I got pretty excited with the weight and compactness and small hopper as its just for home use? What is everyones thoughts? It looks the goods to me but need a push from the illustrious snobs? is there anyone sponsor selling for better deals? matth3wh and ovonate like this. It's not out on sale yet - the reviews are using preproduction prototypes. That said, it does look very innovative, offering the speed and output quality of grinders many times the price. The bottomless grind path means that it essentially retains no stale grounds, which is ideal for domestic usage. Not sure anyone even has a 270w prototype yet, do they? There's quite a long thread maybe a two or three pages back, but mostly speculation. For $769 I'd want to see it in the flesh though - I don't mind spending $300 on things that aren't built like tanks but that's getting up there. I have heard issues with the portafilter arms being problematic for smaller baskets (Guila is ok) and naked PFs. Last edited by simonko; 3rd July 2016 at 09:20 PM. Thanks for the reply mate. Yes I just thought that it being due September that some of the sponsors may of had a crack of the test model. Being due September to CP I think surely they are out of the prototype stages. Being a cynic at heart I actually am reluctant to say its been exactly what i have been looking for. Removable small hopper with the grind path you mentioned so little wastage. Along with the scale to weight dosage etc all with the small footprint. Hi simonko, Going to repost part of my message above. Thanks for the reply mate. Well I have heard very good things from Baratza/vario in regards to reliability and longevity (sure there will be lemons). For the features listed,I was actually surprised at the price. I see alot of other comparable grinders around the 1k mark (really for what they do it is still expensive but meh). Thanks for raising the arms issue. I will try and take my basket in in sep. Yes I just thought that it being due September that some of the sponsors may of had a crack of the test model. Being due September to CP I think surely they are out of the prototype stages. matth3wh and dlight like this. Your PF will be fine and apparently an adapter is coming out for those with smaller baskets. I don't know if it's changed recently but Baratza used to hit a nerve with a few sponsors as the importer allowed little margin for local dealers. But I'm pretty sure Coffeeparts didn't carry Baratza back then either so maybe things have changed. Baratza's cheaper grinders are known for their unreliability, so depending on how sturdy and reliable the Sette is, the sponsors who steer clear of appliance style gear probably won't touch it anyway. If the grinder works out ok in the field, I might purchase it because of the weighing and bluetooth. matth3wh, gonzo89 and wc047 like this. Certainly will be very interested to see how things pan out with this grinder. May look to down size from the La San Marco SM 95/A. Last I've seen on manufacturers site and US stores is that it's arriving/shipping in October. Not sure if CoffeeParts and other AU resellers will be getting it before then (ready to meet AU standards). "The good news is that we have made significant progress on our certifications this week – we have passed EMC (electromagnetic compatibility), the most difficult of the tests. We expect to complete the rest of the certifications within the next three weeks and then production will start shortly after that. Certifications for electrical appliances, such as grinders, is complex and challenging. With the Sette Series we have approached certification from a worldwide perspective. This has lengthened the certification process, but we feel, in the end, that this will simplify our worldwide release. The downside is that this certification process has caused delay in production and shipping. We have notified our Resellers in the US and Canada that they will now receive grinders in the 2nd week of October and you (grinder user) can expect to get them very soon after that. We are working on the updated timeline for our International Resellers, but currently are moving towards Mid November for availability. Thank you for your patience as you await the delivery of your Sette." Appears they updated / altered the design slightly of the portafilter holder. Others have already noted in reviews and testing that the old design wasn't as secure as they would have liked as well as possibly getting in the flow of grinds dropping in to PF. Not surprising given that the units in the field are preproduction prototypes. They were always subject to changes. looks like a pretty amazing grinder: small, weighs the coffee and does a 18g shot in 4.5 seconds. the build quality may not be as bullet proof as other units but for a home user should be fine. matth3wh and wc047 like this. I actually watched the vids on HB yesterday - the speed is pretty impressive - pretty close to the Robur! wc047 and glensmith2212 like this. Dimal, gonzo89, wc047 and 1 others like this. Yeah that reflects my thoughts also. I was very excited at first but then realised that at that price point it really is more appliance like. For what the forecasted cost of the unit is I wouldn't like to be disappointed with it. My Major is totally fine for my needs, it's the features of the Sette of course that has me very keen and should it appear to be an appliance that lasts lets say 5 years trouble free I could live with that. Jim Schulman blind tested this vs a K30 and the K30 won. Sette was judged a good grinder at a keen price point but not the silver bullet for taste. Has Jim posted his findings from testing ? Or was this from the Sette blind taste test Dan ran at counter culture? Wow, that's a long quoted burr life. And they are conservative in their calcs based on their 5 sec / 18g per double. The 5 sec on seems a bit short if you are grinding for a larger pour over or similar? I hope this grinder stacks up for durability. I think we're talking about the same thing. dans review linked to a Jim Schulman led exercise quite possible hosted by Dan. Will be interested to see the more detailed reviews from variety of users. The motor is rated for 150 hours vs something like a kafatek monolith which has a 10,000 hour rated motor. My main question mark for the Sette will be on how many problems will be experienced by the users with the V1.0 of the Sette. Not sure if it's this CounterCulture and mentioned on HB by the looks "K30... wins this taste test against the Baratza Sette, 7 to 5"
The Baratza Sette range is estimated to arrive in December with all pre-orders are expected to ship mid December 2016. Will they just be in time for Christmas...? Last edited by matth3wh; 7th October 2016 at 05:44 PM. Or you could just buy it from the "main resellers list pricing"
CP are site sponsors and they've been helpful on previous orders. If there's any returns required for faults then a Sydney based seller would be better for me. Double checked and see 5S have a Sydney office. My mistake. (Thought they were only WA and Melbourne). So I guess that may be an option for some to see the grinder in action first. Dimal and Logga like this. Double checked and see 5S have a Sydney office. ..... So I guess that may be an option for some to see the grinder in action first. Exactly thoughts on this grinder. I'm up for a look and a feel first hand, but am in no hurry to buy, and I for one am not taken by the look. Does anyone know if this grinder has been released in Australia? I was wondering if the novel theory behind this device works in the flesh. No hasn't been released yet. Last update I had was it was due to be in Australia closer to Christmas; and so with Australia Post being busy over that period they were expecting it to get to customers by early Janurary. Yes it has some very interesting ideas; I was almost curious enough to pull the trigger and get one..
Just at the price; it made it a hard sell for an unknown grinder. You can get a rock solid grinder for that money. Five Senses might just squeeze it in before Christmas but that is yet to be seen. As I believe they are the main distributor they theoretically are you best chance of getting one first, if you want to be an early adopter. The last I heard from a reseller was at least 3 January 2017. Will not be holding my breath for it though. Think of it as a new year treat. I've seen it listed with pre-order price as low as $449 and $589 for the weight based version. But Google is your friend there. Unknown in terms of real world longevity but in terms of real world usage the 270 has been out getting tested in the wild for a reasonable amount of time now. I'll report back on how it performs when it arrives. I originally decided that I wanted a 270 with the auto scales but then thought that, as a home user (3-4 double shots per day), for the scales to work effectively I would need to keep slightly more than enough beans in the hopper for each double shot -leading to staling of the residual beans in the hopper. I currently avoid this by pre-weighing just sufficient beans for each double shot (allowing 0.2grams extra for retention) & grinding them in my Mazzer. I store my beans in a vacuum. I decided that I can continue to do this & I can also monitor retention if I wish to by weighing the grounds output. This means a not insignificant $ saving in the 270 purchase cost but it also avoids encountering the maintenance problems that generally arise with more complex machinery. I store my beans in a vacuum. You might want to have a look at this post as well as other threads in the Roasted Bean Storage Forum. Dimal, trentski and Yelta like this. No argument from me on this point. The 270w is certainly meant to shine in a situation where you want to roll out back to back shots without pre-weighing. I'll be interested to see more how many beans would stick around in the throat of the grinder in a locking off hopper situation. Last edited by matth3wh; 27th November 2016 at 04:44 PM. I'm assuming we'll see more posts to YouTube over the next few days. The SCG Crew Review videos are definitely better than they used to be, but Gail is still pretty painful to watch. The grinder looks like it does what it promises. ....but you have to admire Gail's passion. If I was in the US I would buy from her that's for sure. She's certainly been around for a long time. Thank god they got rid of the lady that used to hold the camera, now she was very loud and high pitched. LeroyC and MCT like this. I think she wanted to be in front of the camera based on her incessant jabbering. (3-4 double shots per day), for the scales to work effectively I would need to keep slightly more than enough beans in the hopper for each double shot -leading to staling of the residual beans in the hopper. Your consumption rate is a kilo in under 2 weeks. At that rate, as long as you're buying or roasting the beans fresh, there's no issue with keeping a couple of days worth in the hopper (assuming the grinder isn't sitting in direct sun etc). Fresh beans need to breathe a bit and degas anyway. liamo, trentski and Wynton87 like this. If you didn't want to throw all your beans in (and with herzog's comment in mind) you could measure out your daily coffee consumption worth in to the hopper once a day. See how the 270w goes measuring it back for you. Bumping this thread as I've heard they should have started to trickle in to Australia now. Has anyone had any hands on experience yet? I'm really eager to get one, but having a Pavoni worries me that the grind wont be fine enough (Though Baratza have assured me they will. 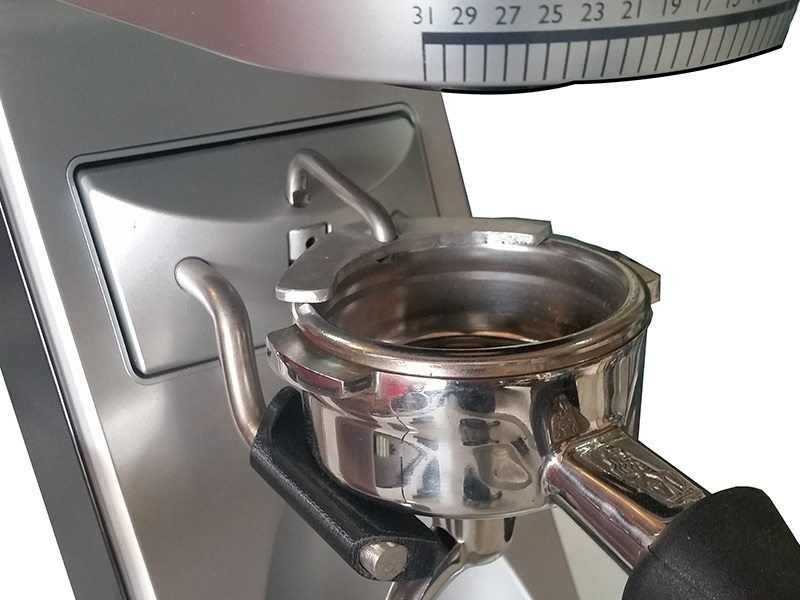 They've also said that the minimum portafilter size is 50mm which should cover most(all?) machines anyway. A $600 risk I really don't want to have to take regarding the grind! fell off first. Then he's dropped off recently. Lack of comms hasn't helped inspire excitement. That and the fact that they had a Christmas discount sale and those coming in ordering later could got a 10% discount on the price plus other resellers seem to offer better pricing in general. I believe 270W sold out* before 270 which makes sense. * "No longer available for pre-ordering" which is likely distributor talk for - we've pre-sold all the units we allocated and those allocated to other resellers. 270W initial stock is sold out and the next batch is not due for another month. Other resellers are talking end of January / early Feb now. Some early quick anecdotes/reviews coming in with varied results coming in from the scales of .1g to 1.5g difference from set. Will be interesting to see how it all pans out. Grinding fine enough shouldn't be an issue. Though I have seen mention of a few people in the USA needing shim kits. I think it's reasonable to assume at this point if we choose to be early adopters we may not have the quickest response/resolution to issues. Sounds like there's another shipment on the way. (hopefully not stuck in customs/dock). Last edited by matth3wh; 6th January 2017 at 09:22 PM. Hi MelbRoaster. Is it ok to post a direct link to the specific thread you're referring to?